DETAILS BEGIN TO EMERGE ON "THE DAYTON'S PROJECT"
There's a plan in store for the former Macy's flagship space located in Downtown Minneapolis on Nicollet Mall. Images of the planned project leaked a few weeks ago and now the developer, New York based 601W, plans to make those plans public tomorrow. 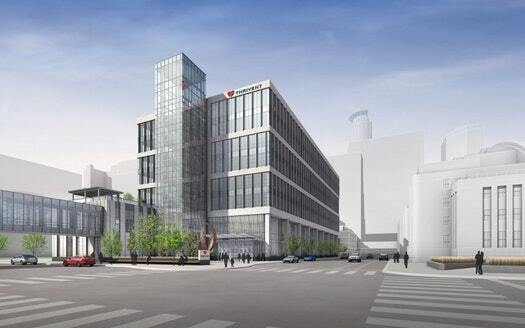 An article published by the Star Tribune Saturday evening gives a glimpse into what 601W and architecture firm, Gensler, have drafted up for the massive 1.3 million square feet of space. The redevelopment of the building will be spread across 12 different floors and will be located in three different buildings, the total of amount of space being just slightly less than the 57 story IDS Center across the street. Plans for the project show the basement level and first floor of the building being devoted to public use, with the upper floors being devoted to office space. The basement level would contain a large entertainment venue with a bowling alley (Dave and Buster's would be a perfect fit) along with a large food hall that would have space for over 20 vendors, some of which would rotate every few months, and a large retail space. The ground floor is nearly entirely devoted to retail space with a few spaces for food and beverage service. A large retail space will anchor the corner of Nicollet Mall and Seventh Street and will be combinable with the retail space directly below on the basement level. The upper levels would contain office space with single floors allowing for up to 90,000 square feet of continuous space, something that is rarely heard of in the office marketplace. Amenity space will also be found on the upper levels of the building that will be available for use by the office tenants within the building. These spaces would include an outdoor rooftop park, a library, a nearly 10,000 square foot fitness center with locker rooms and showers, and more. Developers want to make The Dayton's Project a destination for Downtown Minneapolis. They hope to bring people in not only by bringing in notable restaurants and retailers, but by also having the first food hall for Downtown Minneapolis, a trend that is sweeping the countries largest cities like New York, Miami, and Los Angeles, by storm. In addition, there is a strong desire to keep the over century long life of the building alive. 601W plans salvage and preserve as much as possible of the most important and iconic pieces from the building's glory days as the Dayton's Department Store. In addition, the name itself of the project will help that legacy live on. Plans for some of those iconic pieces, such the famous Oak Room, have yet to be solidified. The developers and architects for the project are working on multiple scenarios for that particular space, some of which would allow the Oak Room to be accessed by the public in its current location, others potentially deconstructing and reconstructing the room within a different space within the building. If all goes according to plan, The Dayton's Project's transformation from a vacant retail store to a vibrant downtown marketplace and destination could be complete by 2019. Minneapolis finally has it's first glimpse at what will officially become it's tree filled, activity bursting, and sun bathing park. Oh yes, and it's right Downtown we might add. We're referring to "The Commons", a new $22 million dollar park that will be constructed right in front of the Minnesota Vikings brand new $1 billion (plus) stadium. Hargreaves Associates presented their plans to the city of Minneapolis and its residents last night at a public meeting. The 4.2 acre site is an outdoor gathering space that Minneapolis can truly be proud of. The latest plans show quite a bit going on in the two full blocks of park space. The space closest to the stadium itself includes a multitude of things. The largest area is called "The Great" lawn and features just that, a large grassy open area. There is a 40x40 stage along with a shade structure located next to the Great Lawn along Park Avenue. The Great Lawn area can hold up to 6,000 people for events and gatherings. Two major promenades will run along side the park in its entirety. One will be on 4th Street, the other on 5th. Along the 4th Street promenade there is space for kiosks and outdoor tables (think Bryant Park in NYC). Portland Avenue will remain open but will be reduced down to two single traffic lanes and a bike lane. The second block running towards the core of downtown Minneapolis will feature a smaller grassy area called the "Good Lawn". There is also a large water feature that stretches across a good portion of the site and a bit of the of the other block. Renderings show the water feature producing mist from the cracks in the surface. It'll be a popular site for cooling down when the summer heat is at its worst. A pavilion along with a play landscape are also part of the plans for this block. This part of The Commons also features a park like site with trails that meander through groves of trees. This second block will abut right up to a new six story 200 unit residential building that will begin construction soon. The Commons will function a bit like Bryant Park in New York City. During the summer there will be space for many activities like bocce ball, chess, and of course the summer time favorite of Frisbee throwing. In the winter space will be available for an ice rink and of course plenty of space for snowman building. Now that the design is in place the race to raise the $22 million needed in order to actually build the park begins. No public money will be given towards the development of the park meaning all will come from private donations. Construction of the park could begin next year.